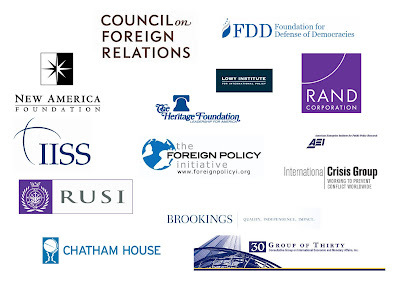 Land Destroyer: FAQ: Why are Globalist Think-Tank Documents Public? FAQ: Why are Globalist Think-Tank Documents Public? Q. Why are such research documents - Which Path to Persia? or "String of Pearls" - made public on the web? If these are in fact strategic and provide a view into the world of powers that run the show on our globe, why would they allow such "sensitive" information and "plans" to be made public for everyone to read? Image: Despite producing the vast majority of rules, regulations, laws and policies that dictate the destiny of Western civilization, as well as drawing up plans for war, these corporate-funded, corporate-serving think-tanks are little known amongst the general public. Despite publishing much of their work on publicly accessible websites, most people will never know about it, let alone take the time to read it. A. You can't keep global empire a secret - by necessity you need people to believe in your cause - even if you dress it up and spin it as something other than naked conquest. The global corporate-financier elite manage access to information by marketing different levels of it to different demographics. This has been done throughout all of history. The explanations provided to the aristocracy to keep them in line was more straight-forward and pragmatic than the absolute fantasies used to dupe and manipulate the common man. It works in layers - papers like "Which Path to Persia?" being toward the top are aimed at people who believe in global governance and globalization - professors, senior editors, CEOs etc. who falsely believe they have a stake in the process - and while it is made public, it is generally inaccessible to the average reader because of its use of academic English, length, and very high minimum requirements in understanding the history, strategy, geopolitics, and human nature necessary to understand the contents. On Brookings' own website you will also see their policy makers pen articles and op-eds for newspapers, sufficiently dumbed-down, in plainer English, and with noticeably more spin in place of the straight-forward frankness of pieces like "Which Path to Persia?" Consider Kenneth Pollack, co-author of "Which Path to Persia?," then penning this fluff piece, "Iran's Covert War Against the US" for the Daily Beast. Below that is your corporate-media propaganda which is almost entirely useless and also the most widely viewed by the greatest number of people. Those that believe anything they see on CNN or Fox are generally unaware that organizations like Brookings even exist - despite their "experts" often being brought on for commentary and analysis. As much as the alternative media has grown, a tremendous amount of ordinary people have still never heard of PNAC, Agenda 21, Brookings (let alone any specific work of theirs) and so on. Also keep in mind that "Which Path to Persia?" while being incredibly frank and incriminating, is not necessarily the pinnacle manifestation of their conspiracy which most likely would not be "public." However, human nature being what it is - we can take what they do make known, and what human history has already taught us and extrapolate what indeed they are really up to and why. I am acutely aware of a possible strategy of tension created by dictating the tempo and nature of global conflict by publicly releasing apparent intentions - then again the global elite of Wall Street and London really are subverting governments with US/UK funded NGOs and there is a paper trail overtly, publicly proving it. Since these NGOs are defended publicly as doing "humanitarian" work when targeted governments crackdown on them, they must show where their funding comes from and appear, at least to the ignorant, as legitimate. Despite both governments -the aggressor and the besieged - knowing the truth, the fact that so many gullible people don't understand that the "National Endowment for Democracy" is actually a corporate fascist front, tips the balance of power in favor of the greater propagandist - Wall Street/London. Of course, the only thing we can ever be sure of is ourselves, our family and friends, and people in our immediate community. That is why facing the vast landscape of geopolitics and a means of implementing change across it is better off being started in your own backyard, on your own block, and in your own community. It is easy to identify those in society who have acquired unwarranted influence, and just as easy in many cases to immediately begin boycotting and replacing them with local solutions.